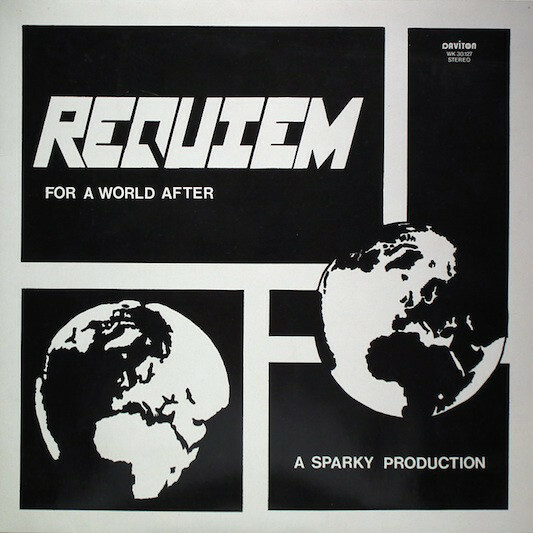 For six months, George A. Speckert and Massimo Grandi laboured long and hard in Sparky Studios to record Requiem’s debut album For A World After. Eventually, the two men had completed what was an ambitious and innovative concept album, For A World After. 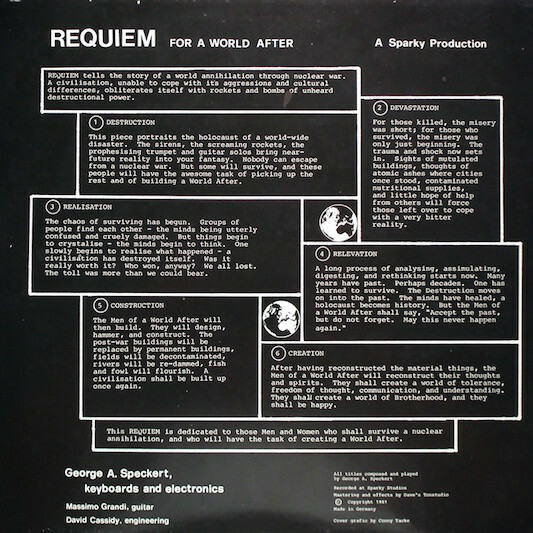 It had been written by George A. Speckert and “tells the story of world annihilation through nuclear war.” Requiem had recorded a powerful and poignant musical statement. Now that For A World After was completed, 1,000 copies were pressed. They were released on David Cassidy’s Daviton label later in the autumn of 1981. Sadly, when For A World After was released as a private press, the album failed to find the audience it deserved. For George A. Speckert and Massimo Grandi all their hard work, dedication and perseverance had been for nothing. It was a huge disappointment. It was only much later that For A World After that For A World After began to find the audience it so richly deserved. However, there was only one problem. Copies of For A World After were almost impossible to find. When they became available, the price was beyond most record buyers. What was needed was a reissue of For A World After. That’s what happened recently, when Requiem’s debut album For A World After was reissued by Mental Experience, an imprint of Guerssen Records. It’s a welcome reissue of a genre-melting, cult classic. Requiem fused elements of ambient, Berlin School, Krautrock and psychedelia on For A World After. In doing so, Requiem reference Berlin School pioneers, Klaus Schulze, Tangerine Dream, Conrad Schnitzler, Dieter Moebius, Popol Vuh and Michael Hoenig. It’s a captivating album, and very different from the music that originally dreamt of making. When George A. Speckert was seven, he told his parents that he want to play the viola in an orchestra. This came as something of a surprise as George had never played the viola. Despite this, the Speckerts encouraged and helped their son to follow his dream. So did George’s next door neighbour, a classically trained musician. He took George along to performances by the philharmonic orchestra. By then, George was receiving music lessons, and night after night, week after week, was practising on his viola. The weeks became months, and the months became years. Still, George continued to dedicate himself to music. He was determined that one day, he was going to make a career out of music. By the time that George headed to university in Evansville, Indiana, he was already a classically trained musician. University was the next part of George’s musical education. It was also where love blossomed for George A. Speckert. During his time at university, George fell in love with his German pen friend. Once he had graduated, George headed to Germany to be with his future wife. However, this meant sacrificing his dream of playing viola in an orchestra. Instead, George got a job as a music teacher in the village of Bünde, in North Rhine-Westphalia. The only problem was there was no call for a viola teacher, so George found himself teaching piano and the basics of composition. Soon, George was climbing the career ladder, when he became music director in the nearby city of Löhne. Despite being a more prestigious post, George became frustrated at the amount of paperwork he having to do on a daily basis. This was stifling his creativity. After a while, George decided to rethink his plans. He decided to spend half his time working as a school administrator, and the other half writing, recording and producing music. This was the best of both worlds for George A. Speckert. Before long, he was a familiar face within the local music scene. George wrote songs and worked as a producer. Sometimes, he would work with local school bands. This could range from writing a song, producing their music or even programming a synth. Not that synths were commonplace. They were beyond the budget of most bands. The first time that George A. Speckert came across a synth was when he was producing a children’s record. George had been booked to produce We Are The Wives Of The Wanted. He also ended up accompanying the three girls on synth. This was a first, and was something of a eureka moment for George A. Speckert. Suddenly, George A. Speckert wanted to know more about synths and the nascent musical technology. He also realised what was possible with synths and the new musical technology. Soon George realised, that the nascent technology would allow him to record an album. That was still something of a pipe dream. Before George could even contemplate recording an album, he had to buy the necessary equipment and learn how to use it. Fortunately, he knew of a shop in Herford, in North Rhine-Westphaliathat that sold synths. It was owned by another American expat, David Cassidy. He also owned a recording studio and record label. Both would play an important part in the story of Requiem’s debut album For A World After. That was still to come. On his first visit to David Cassidy’s music shop, he helped George choose a suitable synth. Little did George realise that this was the start of a musical voyage of discovery. It was also the start of an expensive six month period for George. Over the next six months, George assembled an array of synths, plus a keyboard, sequencer, drum machine, organ and Fender Rhodes. This proved expensive, and used up much of George’s disposable income. The rest he kept in reserve for recording his debut album. Having bought the equipment, George set about discovering how to use it. Soon, he was immersing himself into the world of synths, sequencers and samplers. For a newcomer to the nascent technology, it was a steep learning curve. Soon, though, George began to realise the opportunities that the new technology offered. This would soon include recording Requiem’s debut album For A World After. Inspiration for For A World After came about after George spoke to a friend who worked for the German government and the possibility of an atomic bomb being dropped on Germany. They were worried about the possibility of a third world war, between the East and West. It was after all, the height of the Cold War. George listened as his friend explained that if an atomic bomb was dropped, there would be no survivors. This was a horrifying thought, but one that inspired George to write a concept album, For A World After. During For A World After George: “tells the story of a world annihilation through nuclear war.” This begins with the two aggressors unable to set aside their cultural or ideological differences. Soon, they’re unleashing an arsenal of bombs and rockets. Before long, the world is totally obliterated. However, like a phoenix from the ashes, the world and civilisation rebuilds. After the Destruction and Devastation, the world gradually rebuilds. This George planned on doing over six cinematic soundscapes lasting forty minutes. To make provide the soundtrack to this third world war, George planned to deploy his newly assembled arsenal of instruments. This included a Korg MS 20 mono-synth; Korg SQ-10 sequencer; Casioton CT 201 electronic keyboard; Crumar DS-2 mono-synth with a polyphonic string section; Jupiter 4 polyphonic synth; Crumar Multiman orchestrator and a Yamaha CS5 mono-synth. To this, George added a drum machine, organ and Fender Rhodes. They had all see better days, but would be utilised by George during the recording of For A World After. He would play each of these instruments. The only other musician who featured on For A World After, was Italian guitarist Massimo Grandi. He had been introduced by David Cassidy, who owned the music shop George bought all his equipment from. Massimo Grandi’s guitar would prove to the finishing touch to For A World After. With Massimo Grandi onboard, work could begin on Requiem’s debut album, For A World After. They spent six months recording when the album at Sparky Studios. Massimo laid down the guitar parts, while George took charge of keyboards, synths and the rest of the nascent technology. David Cassidy engineered the sessions and fulfilled the role of producer. Gradually, the album began to take shape. Eventually, six tracks lasting just over forty minutes were completed. All that reminded was for David to master For A World After. After this, 1,000 copies of For A World After were pressed. It was released as a private press on David Cassidy’s Daviton label. George managed to secure a distribution deal for Requiem’s debut album. Alas, For A World After wasn’t huge a commercial success. That is despite the music being ambitious, cerebral, challenging and innovative. For the two members of Requiem, it was a huge disappointment. They had dedicated six months of their lives to For A World After. It would be much later when For A World After eventually found the audience that it deserved. Opening For A World After, is Destruction. It portrays the world on the brink of destruction. From the distance a slow and moody arrangement unfolds. A code being tapped out on a synth, before rockets soars above the arrangement. There’s a sense of foreboding as synths replicate a siren. It seems that the first bomb has dropped, and what was once a nightmare scenario has become reality. Ethereal synths are joined by a crystalline guitar solo and replicate the post nuclear landscape. Still, the sirens sound, despite there being very little, if any chance of anyone surviving the resultant nuclear winter. Drumbeats signal its onslaught, while rockets and bombs seem determined to obliterate humanity. Synths add a dramatic and urgent backdrop, while others replicate sirens, rockets and bombs. Surely, nobody can escape from this onslaught as third world war plays out? It’s a realistic, poignant and cinematic portrayal and reminder of the Cold War era and what was the nightmare scenario. Somehow, a few survive the onslaught of bombs and rockets. They’re left to face the Devastation. People have been injured, mutilated or poisoned by the bombs that have been dropped. Towns and cities are reduced to rubble. Requiem set about creating a dark, dramatic and bubbling soundscape. Listening to it unfold, it’s sounds as if the listener is looking down from a helicopter on the trail of Devastation. As the listener is taken on a journey, slow, buzzing synths and the occasional guitar create a dark, despondent backdrop. Sometimes, it sounds as if the sound of bird song can be heard. They seem to be one of the survivors. Later, there’s a rueful, wistful sound as Requiem successfully create a post nuclear soundscape. There’s a sense of despondency and hopelessness as synths glide and bubble and the drama builds. So does the bleakness that’s replicated by a bass synth. By then, the full scale of the Devastation becomes apparent to the survivors. It’s only having surveyed the Devastation, that there’s a Realisation by the survivors that civilisation has destroyed itself. Suddenly, the survivors are left confused and despairing at the cruelty, damage and Devastation that mankind has caused. A bass synth is played quickly as washes of futuristic music assail the listener. They’re akin to the thoughts that assail the listener as that they’re struggle to make sense of what they’ve discovered. Fittingly, the arrangement becomes dark, ominous and takes on a sci-fi sound. This suits the mood of the survivors. Synths are to the fore, and glide darkly and ominously along. Meanwhile, an effects laden Michael Rother inspired guitar is addd. Still, the bass synth dominates the arrangement, while the guitar and glacial, ethereal synths play a supporting role. As the sound draws to a close, the darkness seems to dissipate. Maybe there’s hope for the future? Relevation finds the survivors analysing what’s happened in an attempt to make sense of it. Many years have passed since that fateful day. Everyone has accepted what happened and are determined to learn from their past mistakes. They’re determined that this will never happen again. Meanwhile, the soundscape begin to unfold, and a pulsating bass synths joins with gusts of wind and sci-fi sounds. A searing, rocky guitar joins elegiac, ethereal synths. Some of the sounds used, are almost reminiscent of Destruction. However, there’s a sense of hope, hope for the future as the guitar plays. One can’t help but wonder whether the gusts of winds signal a rebirth, and a new beginning for the survivors? Especially as the drama builds. Soon, the pulsating bass slows down and the guitar hangs in air. It’s as if it’s signalling a new beginning. It does. Construction marks a new beginning as the People Of The World design and build new buildings. This is part of rebuilding of the post war infrastructure. Straight away, there’s a Krautrock influence in the drums. Meanwhile, notes and chords are picked out on the banks of synths. Sometimes, stabs of synths add to what’s a hopeful and upbeat backdrop. It’s very different to what’s g before. Synth strings are used to sweeten the soundscape. Briefly, the synths used are reminiscent of those used during Kraftwerk’s classic period. Augmenting the banks of synths is Massimo’s guitar. He unleashes a blistering guitar solo which cuts across the arrangement. It’s the perfect foil for George’s synths, during the joyous backdrop to this new beginning. Closing For A World After is Creation. Having constructed the material things, the People Of The World decide to reconstruct their thoughts and spirits. They decide that tolerance, freedom of thought, communication and understanding are crucial to this work of this “Brotherhood” where everyone is happy. Synths are to the fore, with waves of synths pulsating, ebbing and flowing. Meanwhile, the lead synth piays the leading role in what could be this utopian land’s anthem. There’s a sense of hope and poignancy as the music unfolds. It marks the start of a new era for the People Of The World. After six soundscapes lasting just over forty minutes, Requiem’s poignant concept album For A New World is over. It: “tells the story of world annihilation through nuclear war,” the aftermath, and how the People of the World having learnt from their mistakes, and rebuilt a new and better world. Out of despair, despondency and Devastation, came a new beginning and hope for the future. However, when Requiem released For A New World in 1981, it was poignant and thought provoking album. Back in 1981, it was still the Cold War era, and a generation on both sides of the Iron Curtain lived in fear of nuclear war. For A New World is a reminder of these days, and what was the worst case scenario. Requiem replicate the Destruction, Devastation and the Realisation that mankind brought about the destruction of the civilisation. Then Requiem replicate the Construction and Creation of the post war landscape. To do this, George A. Speckert deployed banks of synths and the latest in musical technology. Adding the finishing touch was Massimo Grandi’s guitar. Together, they were responsible for what is nowadays regarded as a lost classic. When For A New World was released, the 1,000 copies failed to sell. That was despite being ambitious, cerebral, challenging concept album. For A New World was genre-melting, cult classic that stood head and shoulder above the competition. Requiem fused elements of ambient and avant-garde with Berlin School, electronica, experimental, Krautrock, psychedelia and rock. Similarly, Requiem drew inspiration from Berlin School pioneers, Klaus Schulze, Tangerine Dream, Conrad Schnitzler, Dieter Moebius, Popol Vuh and Michael Hoenig. The result was a captivating and cinematic album, that was a heady and potent brew of musical genres and influences It should’ve introduced Requiem’s music to a much wider audience. Sadly, it was a familiar story. Just like many private presses released on small labels, the Daviton label lacked the financial muscle to promote For A World After. However, George A. Speckert wasn’t going to give up without a fight. He negotiated a distribution deal which helped sales. Still, though, Requiem failed to sell the 1,000 copies of For A World After. Record buyers in 1981 missed out on hearing an ambitious, captivating, cerebral and challenging album of innovative and cinematic soundscapes. 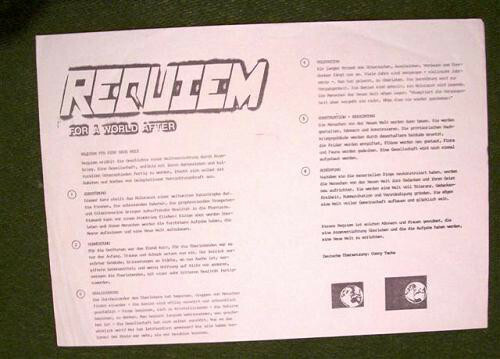 It was only much later that Requiem’s For A World After began to attract the attention of record buyers. Soon, the album had attracted a cult following. Alas, by then, copies of For A World After beyond the budget of most record buyers. Copies of For A World After were changing hands for upwards of $500. This meant that a new generation of record buyers were unable to discover this cinematic and thought provoking concept album For A World After. Fortunately, this was recently rectified, when Mental Experience, an imprint of Guerssen Records reissued Requiem’s debut album For A World After. For anyone interested in Krautrock or the Berlin School of Electronic music, then Requiem’s debut album For A World is a cerebral cult classic. For A World is also a cinematic hidden gem that’s a powerful reminder of the dark days of Cold War era, when Destruction and Devastation loomed large in the lives of people on both sides of the Iron Curtain. ← THE BEST VINYL REISSUES OF 2016-PART 1.